I posted this guy the other day and talked about the process behind him. During the final steps of this guy, I took two photos. One when any normal hobbyist could call it quits and walk away with a great looking model and another after I went back in and added just a few more details to the model to bring it to life. Most of those details were added to the base. I didn't have to do much. Actually, I didn't have to do anything, but I wanted to give the base an extra touch or two like the model had to bring it up to the same level. Ever notice the bases on other armies? You remember the nice ones don't you? You remember those few bases that had the extra details added to them that really made them look complete. I'd go so far as to say you could judge the completeness of a paintjob by how much work was put into the base as well. 1. Add some additional spot washes for color. 2. Add one additional layer of highlighting. 3. Add some static grass. 4. Add a few patches of snow. These aren't terribly difficult things to do to a base either. Taking a couple of different color washes a dabbing them on in a few places isn't tough. The benefit is that you can add some color variety to your otherwise dull and monochromatic base. It doesn't have to be much, just a hint of color here and there. The additional drybrush highlight... well that's nothing more than repeating a previous step with a slightly brighter color after you add your spot washes to get some contrast back on the more prominent edges. The static grass and snow are quick fixes too. I've tried my hand at them before and can offer the following tutorials on how to apply them. A base that is up to the same level of detail as the model will do two things. First, it will make the model look complete and second, it will do a better job of creating that environment your model is supposed to be operating in. 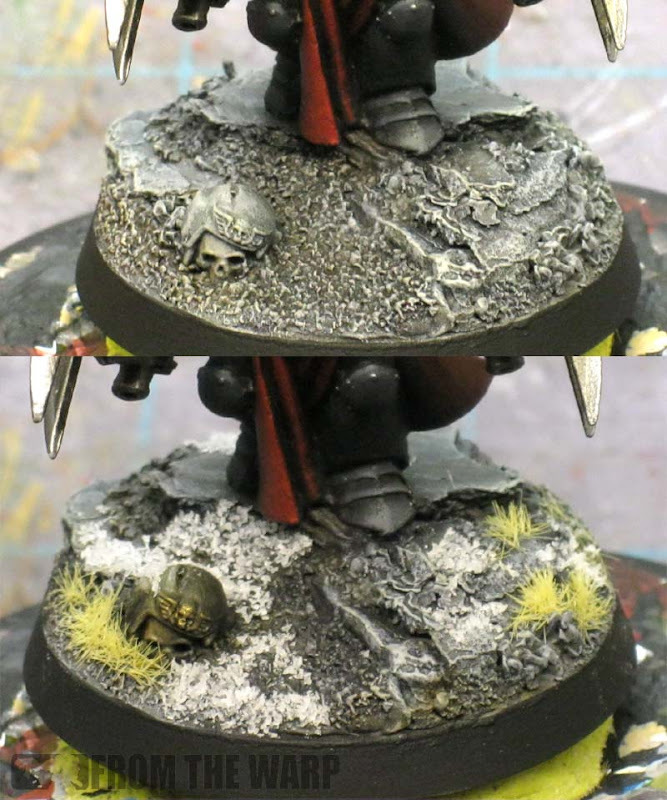 You don't need Golden Demon level skills to dab on some washes or drybrush the edges of some gravel. But if you take a few minutes at the end and look at what you can do to your basing to give it that extra touch, you'll be amazed at what it does for the overall appearance of your army. Hi Ron! I was wondering how you make these rocky bases. 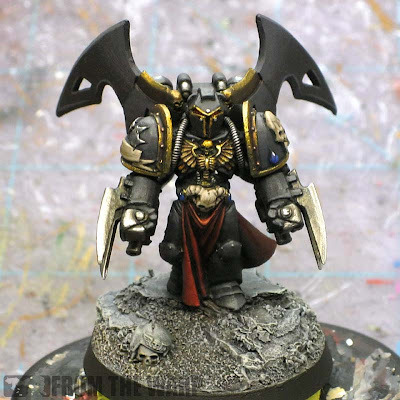 I fell in love with them when I had read your Flesh Tearers articles. I think you talked about chip type bark in your chaos lord restoration complete article. I think I have such things but mine are curved and yours look flat... Or maybe, did you use slate? Anon: Thanks. The Flesh Tearer bases were resin for that particular squad, but this guy is the chipped bark. I don't have any actual slate and prefer to use the bark instead since I can manipulate it into the shape, size I want without much work. Great looking base, Ron. I think most people would be happy with your 'before' shot, but it's nice to see what a very small amount of extra work can do! I agree completely with this article. My models never look 100% until they at least have some grass on them or some leaf litter. It's the scenic details that really bring them to the next level of realism. its fundamental to finish a model a good base.. Very nice. I'm curious what colors you used. Mind giving us a breakdown? I'll second Ron's preference for bark chips - they're also cheap! Geek: That's the reason for the post. Something like this is small enough that you could go back and "upgrade" your army with an extra touch or two. Unless you're one of those poor souls playing Guard or bugs and have just under 10,000 troops to do this to. LuckyNo.5: There's just something about static grass on a base that says "I'm finished now." oni: The washes were Badab Black in the deepest recesses and then either Devlan Mud or Sepia in some of the other textured areas. Sometimes I thin them down too, you just want a hint of color. Once that dries, it's a quick final drybrush over the high points for some final contrast. I will say that I did start to experiment with adding a wash to the static grass too. The grass I have is one color. To get a bit of variety, I waited until it had dried in place and then I went back and added some of the washes used on the base to the grass. It's subtle, but it helps blend the grass in to the earth under it. Alex: They are my go tool for mimicking slate and broken marble. It strikes me today, that your painting style is definitely recognizable - I've seen a thumbnail of this miniature in some blogroll, and was sure it's yours. Magiler: Thanks. I like to think I'm developing my style. I know I have certain things I do regulary on models. love the look you chose for the model, pure awesome. 40knjny: Thanks, but honestly... all I did was try to "update" the previous scheme and bring it more in line with the grim dark future so to say. The red on that tabard is gorgeous, what is it? Anon: If I remember correctly, it's just GW Mechrite Red that has been wet blended into black.